Our sense of hearing is often taken for granted, but is instrumental in our everyday lives. Among numerous functions, our auditory system informs us of our environmental surroundings, allows us to enjoy music and freely communicate with others through vocalizations. The mammalian auditory system is composed of a peripherally located sound collecting device (the external ear), a sound conducting system (the tympanic membrane and middle ear ossicles), mechanoreceptive hair cells in the cochlea, the auditory nerve and a complex neural circuitry within the central nervous system. Unfortunately, each of these structures is capable of dysfunction, through disease, injury or developmental malformation, each of which can greatly diminish our sense of hearing. The mission of LECOM’s Auditory Research Center (ARC) is: Using the auditory pathways as a model system, conduct research that will enhance our understanding of the normal development and alterations that occur in certain disease states. This research will help us better understand the function and dysfunction of the brain and will be instrumental in developing therapeutic strategies to overcome or reverse injury or dysfunction in the auditory system. Examine the structure and function of the auditory pathways in an animal model of autism. Autism spectrum disorder (ASD) is a collection of neurodevelopmental disorders associated with social, communicative and behavioral difficulties. The most recent report by the Center for Disease Control indicates that approximately 1 in 68 children and 1 in 42 boys are diagnosed with ASD. Further, the vast majority of children with ASD have some degree of auditory dysfunction. Indeed, we have identified significant and consistent dysmorphology in the brains of humans diagnosed with ASD and we have identified significantly slower auditory reflexes in children with ASD. Valproic acid (VPA) is an antiepileptic that is prescribed for seizures, migraines and bipolar disorder and pregnant women who take VPA have a significantly higher risk of having a child diagnosed with ASD. 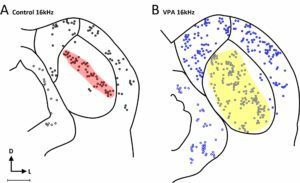 Previous research from this lab has found that exposing pregnant rats to VPA results in significantly fewer auditory brainstem neurons and surviving neurons are significantly smaller and dysmorphic, similar to what is seen in ASD. We are currently examining the impact of repeated exposure to VPA in a rat model on neuronal number, morphology, axonal morphology, expression of calcium binding proteins and noradrendergic and serotoninergic inputs onto auditory neurons. Our hypothesis is that repeated exposure to VPA will result in abnormal axonal trajectories and altered synaptic inputs. By making small deposits of fluorescent tract tracing molecules in the brainstem, we plan to also examine strength and distribution of axonal projections to the auditory midbrain in animals prenatally exposed to VPA. 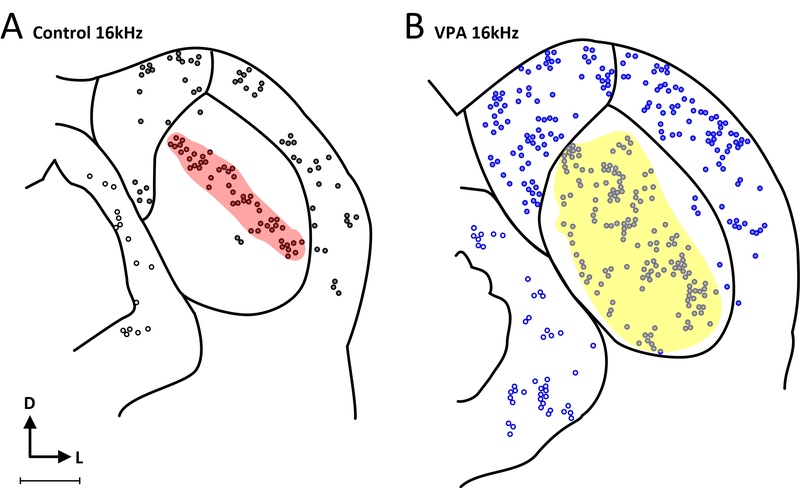 Understanding the alterations that arise in the auditory brainstem after VPA exposure will clarify the changes observed in humans and may lead to simple, non-invasive auditory tests to screen for ASD in newborns. The figure shows neuronal activation in control and VPA-exposed animals after exposure to 1 hour long 16 kHz tone. Note there are significantly more activated neurons after VPA exposure, suggestive of hypersensitivity. To see related publications, please click here. Examine the impact of neonatal excitotoxic injury on auditory brainstem circuits. Environmental insults to the developing nervous system can have a devastating impact on structure and function of the central nervous system. We have recently discovered that excitotoxic events in the early neonatal period, induced by exposure to monosodium glutamate (MSG), results in degeneration of the optic nerves and a 50% reduction of neurons in the auditory brainstem. 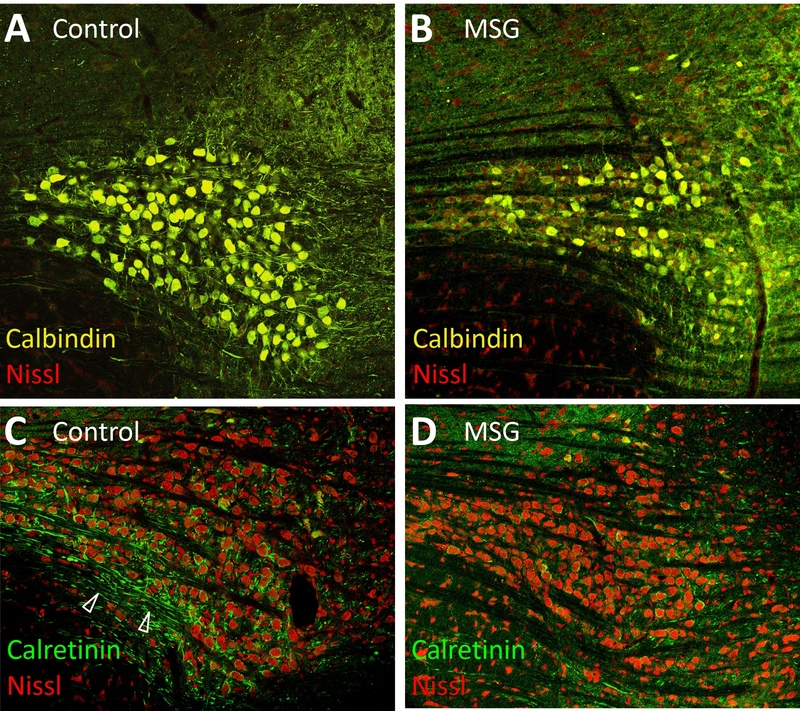 Further, this early exposure to MSG results in abnormal expression patterns of a number of neuronal markers, such as the calcium binding proteins calretinin and calbindin. We hypothesize that such excitotoxic events during the neonatal period result in abnormal axonal projections within the auditory brainstem. Using injections of carbocyanine dyes into specific axonal tracts combined with immunofluorescence and confocal imaging, we will investigate axonal diameters, trajectories and terminals using confocal imaging. Understanding these early changes will elucidate how the neonatal nervous system adapts to injury in efforts to maintain and restore function. MSG Cbs (Click image to enlarge). This figure show the expression patterns of calbindin and calretinin, both calcium binding proteins important for neurons that fire rapid trains of action potentials. 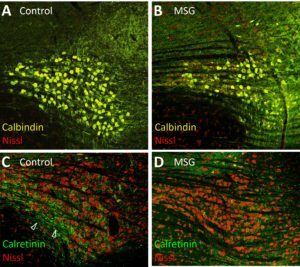 After MSG exposure, there is significantly less calbindin and calretinin. CALYX (Click image to enlarge). This image shows an axonal from a globular bushy cell in the cochlear nucleus and its large, claw-like calyx terminal. The axon was labeled by injection of DiI into the brainstem. Examine the impact of environmental exposure to air pollution on the auditory brainstem in humans subjects and in animal models. In collaboration with Dr Lilian Calderon-Garciduena (University of Montana), we have discovered that children exposed to high levels of air pollution have beta-amyloid (a marker for Alzheimer disease) and alpha-synuclein (a marker for Parkinson disease) in brainstem neurons. These children also have abnormal auditory brainstem responses, severe neuronal loss and dysmorphology in their auditory brainstem. Specifically, we found that there are significantly fewer auditory brainstem neurons and surviving neurons are significantly smaller and dysmorphic. Together, we believe these findings indicate severe toxic damage and signs of neurodegeneration resulting from exposure to air pollution. We hypothesize that in individuals exposed to air pollution, these auditory brainstem neurons have severely affected synaptic inputs and significant dysfunction. We will further examine these potential deficits in an animal model of pollution exposure. Further, we believe that simple, non-invasive tests of auditory function can be used to asses brainstem function and even severity of brain injury in subjects/animals exposed to air pollution. MSO Composite (Click image to enlarge). This figure show the size and distribution of neurons in the human medial superior olive in a control subject and subjects exposed to air pollution. Generally, neurons are fewer and smaller after exposure to air pollution.